How can I create map compositions with custom legends using ggplot? Plot multiple shapefiles in the same plot. 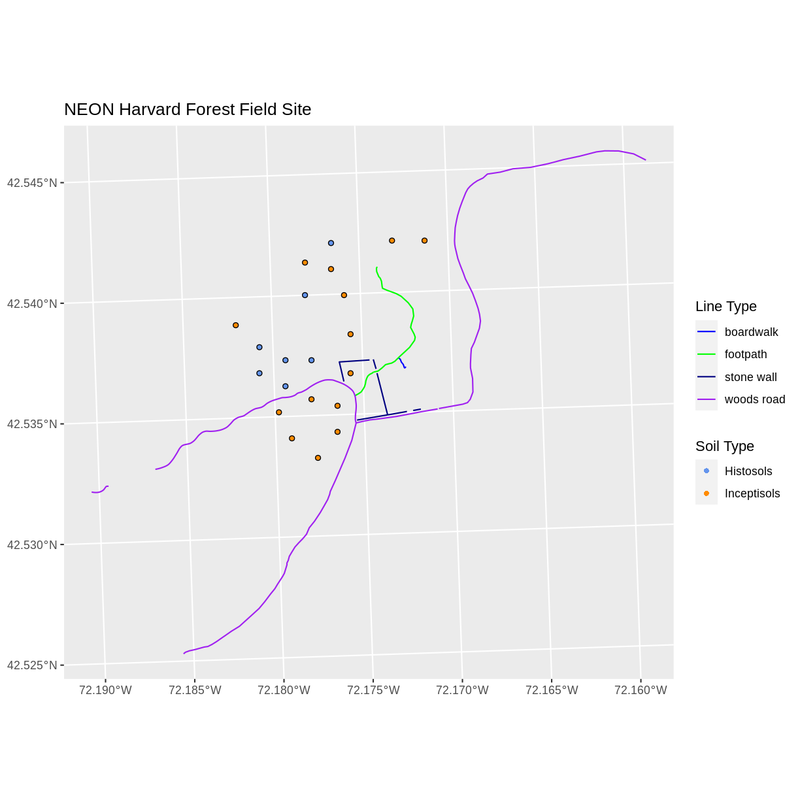 Apply custom symbols to spatial objects in a plot. Create a multi-layered plot with raster and vector data. This episode builds upon the previous episode to work with shapefile attributes in R and explores how to plot multiple shapefiles. 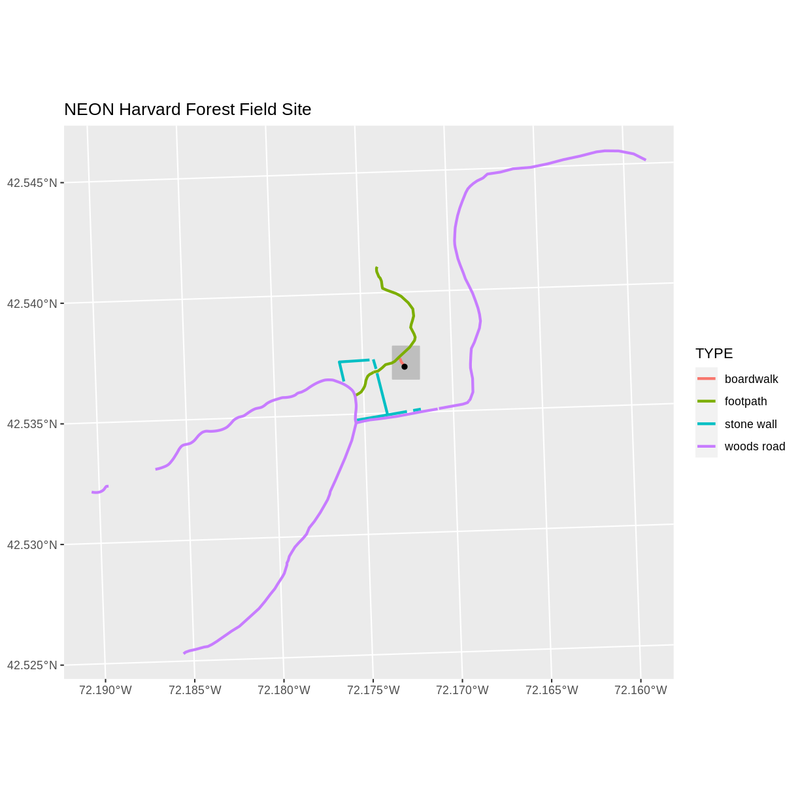 It also covers how to plot raster and vector data together on the same plot. 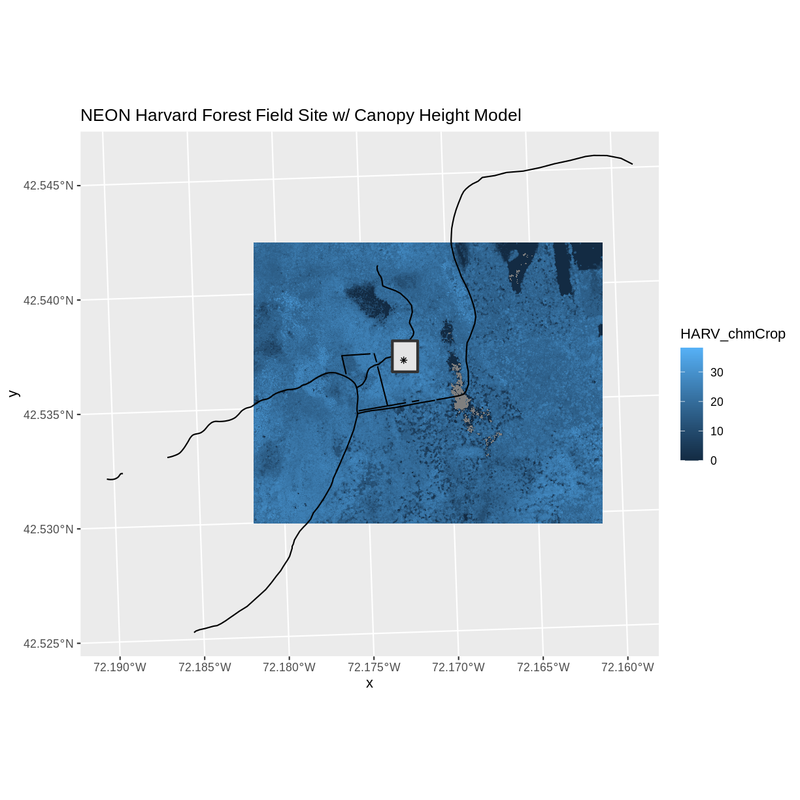 To work with vector data in R, we can use the sf library. The raster package also allows us to explore metadata using similar commands for both raster and vector files. Make sure that you have these packages loaded. In the previous episode, we learned how to plot information from a single shapefile and do some plot customization including adding a custom legend. However, what if we want to create a more complex plot with many shapefiles and unique symbols that need to be represented clearly in a legend? 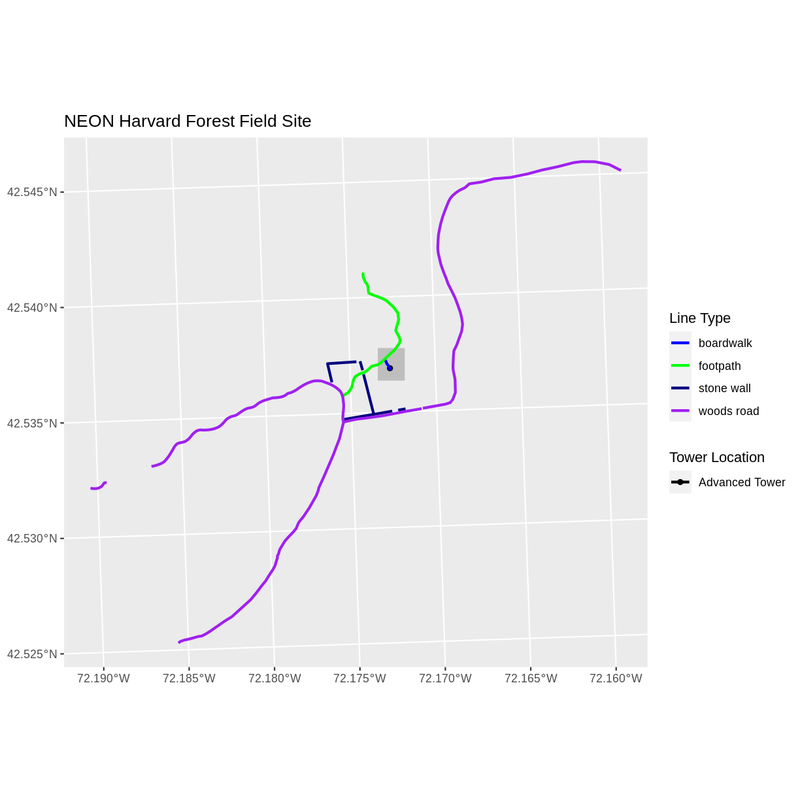 Now, let’s create a plot that combines our tower location (point_HARV), site boundary (aoi_boundary_HARV) and roads (lines_HARV) spatial objects. We will need to build a custom legend as well. To begin, we will create a plot with the site boundary as the first layer. Then layer the tower location and road data on top using +. Next, let’s build a custom legend using the symbology (the colors and symbols) that we used to create the plot above. For example, it might be good if the lines were symbolized as lines. In the previous episode, you may have noticed that the default legend behavior for geom_sf is to draw a ‘patch’ for each legend entry. If you want the legend to draw lines or points, you need to add an instruction to the geom_sf call - in this case, show.legend = 'line'. Now lets adjust the legend titles by passing a name to the respective color and fill palettes. Finally, it might be better if the points were symbolized as a symbol. We can customize this using shape parameters in our call to geom_sf: 16 is a point symbol, 15 is a box. To view a short list of shape symbols, type ?pch into the R console. 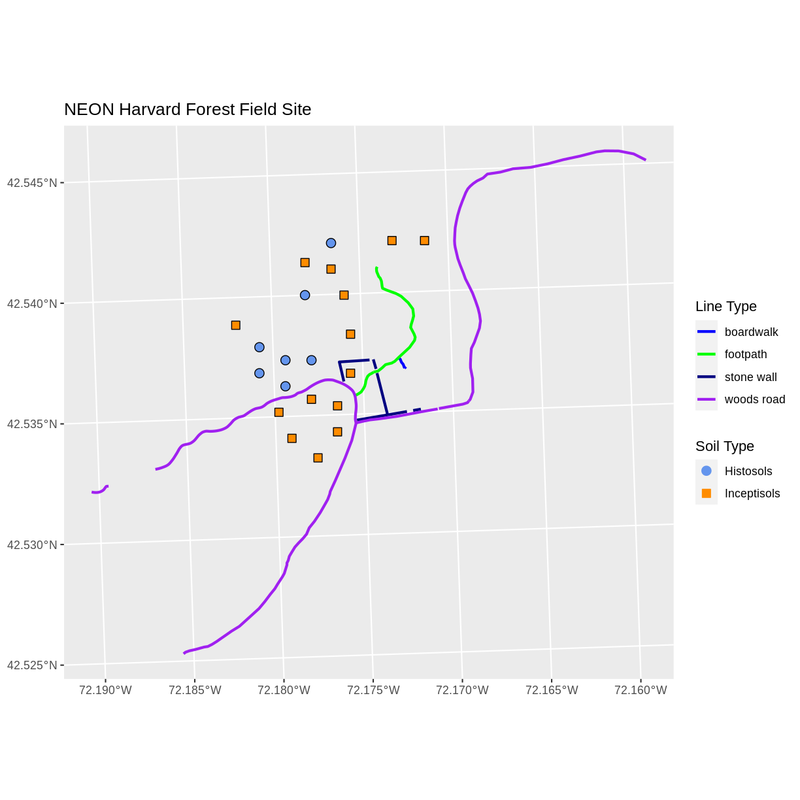 Using the NEON-DS-Site-Layout-Files/HARV/PlotLocations_HARV.shp shapefile, create a map of study plot locations, with each point colored by the soil type (soilTypeOr). How many different soil types are there at this particular field site? Overlay this layer on top of the lines_HARV layer (the roads). Create a custom legend that applies line symbols to lines and point symbols to the points. Modify the plot above. Tell R to plot each point, using a different symbol of shape value. First we need to read in the data and see how many unique soils are represented in the soilTypeOr attribute. Next we can create a new color palette with one color for each soil type. Finally, we will create our plot. If we want each soil to be shown with a different symbol, we can give multiple values to the scale_shape_manual() argument. Be sure to give your plot a meaningful title.